The Idaho Farm Bureau Federation holds a series of conferences each year. Each conference is unique in its purpose and design. 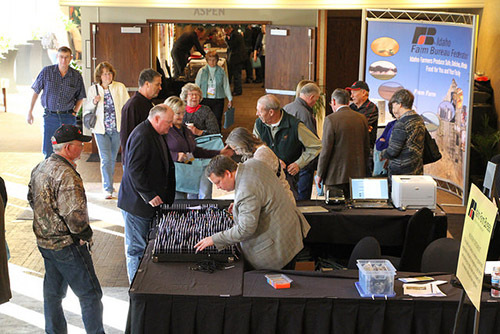 Important Farm Bureau business is carried out in many of these events while giving members the oppportunity to receive updated information on a host of agriculture-related topics. Through workshops, speakers, and informal conversations, conference participants network with top agricutlure specialists, legislators, other farmers, and leaders from all over the state. Registration is required for all conferences and can be completed through the Idaho Farm Bureau Events Registration Link. The Idaho Farm Bureau annual convention is held every year around the end of November or the beginning of December. The primary business of the annual convention is to set policy and elect leaders of the Idaho Farm Bureau Federation. This is accomplished in what is called the House of Delegates. Being a grassroots organization, each of the 36 organized Idaho counties select two farm or ranch delegates to represent them on the House of Delegates floor to discuss and debate all policies. The annual convention is a three-day event and has many components. On Tuesday, participants hear from Farm Bureau leaders and are updated on developments from the past year. A series of workshops follows covering a range of topics. Young Farmer & Rancher district finalist from around Idaho come to the annual convention to compete in competitions. Major awards are given to winners and runners-up in these three different events. Wednesday starts with more education of the different aspects of the Idaho Farm Bureau and launches into the House of Delegates session. The Women's Leadership Program also hold their business meeting during this time. Thursday morning is the continuation of the House of Delegates. Throughout the annual convention, caucuses are held to elect new leaders for the Women's Leadership, Young Farmers & Ranchers, and District State Board Members. All elections results are ratified Thursday morning by the House of Delegate body, who also elect the president and vice-president of the Idaho Farm Bureau Federation on rotating years. Held in February, the Legislative and Commodity Conferences blend together to give focus on current commodity and legislative issues that are occuring while the Idaho legislature is in session. Influential legislators and state department representatives speak and interact with the audience to update and clarify the direction of important issues that affect Idaho's farmers and ranchers. This is a two-day event. In the evening of the first day, a strolling buffet is held where Idaho Farm Bureau members have the opportunity to have dinner with their local state senators and representatives. Market specialists and commodity experts participate in the commodity portion of the conference. Those who have been appointed to serve on specific commodity committee meet and gain knowledge about their specific commodity, particularly how it pertains to current and future Idaho Farm Bureau policy. These commodity committees discuss and surface recommendations for future Idaho Farm Bureau Federation policy. Young Farmers and Ranchers ages 18 to 35 come together at the end of January for fun, education, networking, and more. Those of this age range share many common challenges and this conference gives them the tools and connections to improve their operations. Workshops, keynote speakers, social events, and interaction with experts and leaders of Idaho make this time effective. This is an event that starts late on Thursday and conclused on Saturday morning. Many lasting friendships across the state have been started at this event. The annual Leadership Conference brings together women from throughout the state in a fun, engaging and informative environment. The conference focuses on sharing county successes through educational workshops and interactive roundtable events and takes place early spring. The two day event starts on a Friday and goes through Saturday in an attempt to allow those who work outside the home an opportunity to attend. The conference kicks off with a tour intended to share the story of agriculture in an engaging manner. After a tour, attendees are invited to an Opening Lunch and welcomed by the Women’s Leadership Committee. Following lunch, attendees have the opportunity to interact with other members from throughout the state while learning from a number of ag related topics during Roundtable Events. Friday night concludes with a Banquet Dinner which includes entertainment and is followed by an auction. Saturday events include breakfast, educational workshops and a closing lunch. Any woman from a Farm Bureau family is welcome to register. Women play a vital role in agriculture and those who attend gain support through networking and idea sharing. The Idaho Farm Bureau County Presidents' Conference is held in July. This specific conference gives county presidents the opportunity to receive training, clarify county responsibilities, discuss current issues, and meet with leaders and candidates of Idaho.